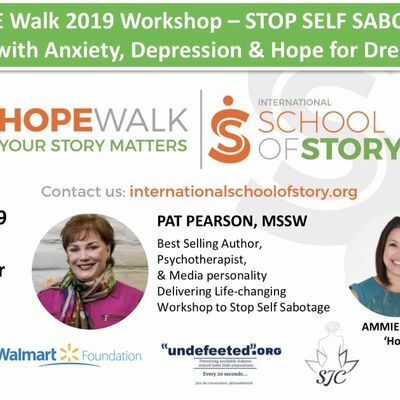 Join us for a HOPE-filled day to deepen your skills to successfully achieve your dreams and goals and to Stop Self Sabotage through this powerful workshop. Registration and networking starts at 9:00am and we will start promptly at 9:30 as we welcome the HOPE Walkers arrival this last day of the 21-day HOPE Walk! What a powerful way to usher in the second quarter of 2019 - with Hope and tools for each next step! We all self sabotage and we have the honor of THE lady who wrote the best selling book on it coming to share the needed tools with us - Pat Pearson, MSSW. Do you hold yourself back because you feel you’re not perfect enough? Is procrastination holding you back from making the money you want? Are you ready to make a bigger impact in the world? Who would you be if you had the courage and confidence to step fully into the person you are meant to be? You are here for a reason to make an impact on the world and fulfill your mission. You are here to make money, doing what you love. it’s your time to step up and claim all that you desire in your health, relationships, career and finances. Pat Pearson is a licensed psychologist, author and business builder. She provides executive business coaching to entrepreneurs and other professional who want to overcome self sabotage and find the success they deserve. the impact of her coaching program has resulted in anywhere from 20% - 60% increased income with her clients after only six sessions. This will be an experience you will never forget!